For more than 25 years, Bob Irwin, the Dean of Sundazed Music, has befuddled, disoriented, and otherwise thrilled collectors and consumers alike by refusing to drive between the lines. Swerving wildly from garage to psych, from surf to soul, from biker to bossa, Bob’s steering with his elbows and hollerin’ like a banshee as he careens all over Route ‘60s, knocking over traffic cones. The show is called Big Planet Noise! – and it’s hosted by Bob and Gina Frary Bacon, the gal with the great voice. It’s almost always all-vinyl, from Bob’s insane collection. The show became a must-listen in Nashville, a town unaccustomed to such carryings-on, and it’s now primed to become a part of your not-too-proud-to-be-surprised lives. Strap in and head to WFMU.org’s Rock ’n’ Soul Ichiban stream, every Monday from 8-10 pm EST! Regular listener (time-shifted, via the app) at work -- thought it would be fun to drop in real time and say that I like this show very much, whether you're playing music I know well or have never heard before. Hi PS Simon! Welcome! I really appreciate hearing that! Hey there, pacific standard simon!! Welcome to the Planet! Hay Bob & Gina !!!! YAY !! Simon - where are you listening from? Snayle! Busy weekend for you! Shortest intro to any show on WFMU! I like how you don't waste any time before getting into the music. Hahaha! RIGHT TO THE MUSIC, Mailman Tom!!! Greetings, Bob and Gina! I hail from Bainbridge Island, WA. 8 miles across the water from Seattle. Not many record pickings here. Well, Simon, I'm flattered that you listen to us! Thank you! That sure is a beautiful place, Simon. Rockin' keeps us young, indeed, Snayle!!!! Hey, it's always a great show and keeps me happy while I'm doing my duty at work. I heart this Chasers tune !!!! Yeah Snayle - it's a great one! I was at a 45rpm record show about 15 years ago when someone was selling off a GIGANTIC Brit Invasion collection. Imports and domestic copies. My lord, I cleaned up. I was the first guy there and had first shot at everything. I wish another one of those would come along... I built 85% of my Brit collection that day! Hey NY Nick! Welcome! Thanks for being with us! You mean the chat thing?!?!? Yeah - but once you got it, you GOT it!!!! no this half dead laptop..
Glad you found your way in! Trashiest Stones recording ever! It's why it was relegated to a UK EP track!!! I have three half-dead laptops. Really need to do something with them. One is converted to Linux, but that's as far as I've got. WOW - that's an amazing find Bob... Lucky YOU ! Bowtie wants to ditch his music collection -- not sure what he's got besides Star Spangled Washboard stuff....hehe. 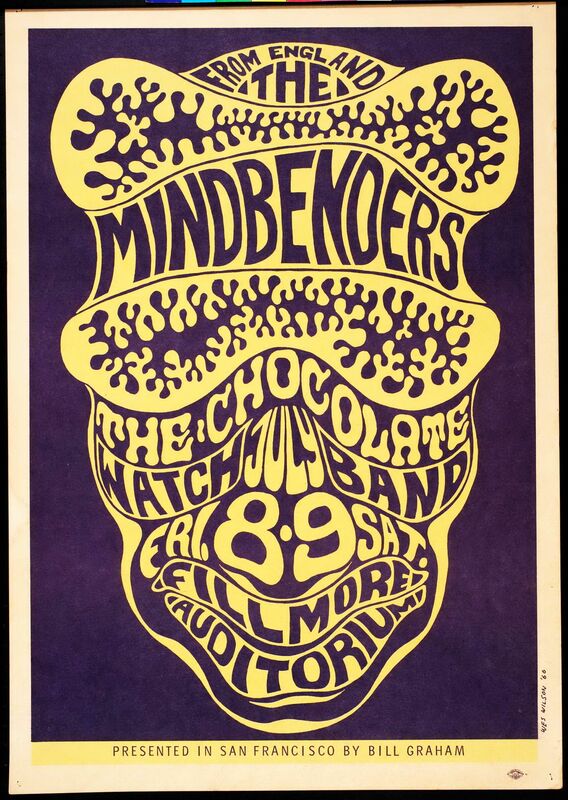 The Mindbenders had a classic SF psychedelic poster back in the day. Thank you, NY Nick! Much appreciated! Thank you, NY Nick...glad you're digging it! PS Simon - YES!!! I have that poster!!!! HOW did Chubby get hooked up with these guys?!?! I LOVE how the guitarist jams the Bo Diddley beat into this track! Such a great one. What a bill! I first heard Baby Baby Balla Balla on Dave the Spazz's show. I fell head over heels for it instantly! Super great. There just never was a bad song he recorded, IMO. And i love Mark Lindsay's fully formed trash talk, even on this early cut! I have to say, I love the Chocolate Watchband, too. Oooh, Simon.... me too. SO MUCH! Close as I get to church! If churches had this guitar tone, I'd be there three times a week. As close as Link ever got to "Time Won't Let Me"! Here comes the craziest guitar of the night! I finally got sort of close to the Link Wray tone on my ukulele by plugging it into a cheap amp, smaller than an LP. You can't even tell for sure what chord I'm playing. Good evening you guys! Hope you're having a great night! I wanna hear that ukulele, Simon! Howdy, Eargasm! Working late? That was some stack of papers! I want to hear that, too! Yeah Simon ! UKE CITY ! There's a guy out here called Jim Boggia who channels Springsteen on his uke in a show called Springsteen Off Broadway - quite awesome... no band, just Jim, his uke and The Boss. LA gig coming up. It is indeed, p s s! A Big Planet... lots of records... from everywhere... no constraints on the playlist. Within reason! Wow, Phil Lesh, so bass.. Thanks for playing it for me. I'd like to request "New, New Minglewood Blues" by the Dead for a future show. The Monkees were my introductory drug to rock 'n' roll. You got it, Mailman! I think you'll dig this one, too! That's an A-OK introduction, Simon! Gimme an F !!!! Gimme an I !!! Gimme an S !!! Gimme an H !!!! One of my fave CJ tunes !!! YAY! Are they really playing ping pong in the background of this? Big Planet fun! Monday nights were so boring, then I found Big Planet Noise and now I can't wait for 8pm to roll around. Nice show folks. Thanks, and nice to see you, Smoketown Joe! Smoketown Joe! Thanks for being here. And - as I've said before - hearing stuff like that always makes us feel great. Thank you! Yes, that's very very nice to hear! This set is just the cat's meow ! Beaus, Bankes and Baroques ! LOVE and THANK YOU! I love the surprises that pop out of my speakers on Mondays, Bob & Gina !!! that's L O V E !!! Kudos to you! still looking at them! Loving this show! Yikes! You're really working late! Yes - please do get those out, Snayle! Hey hey...catching the last hour as I wrap up at work! Cheers! Hey everybody, that’s some good guitar on this record right now! Hey there, Tim from LH! Hey Tim! Yes - love this!!!! Glad you dig it! Gotta go , enjoyed what I heard , Bob & Gina..
What a production on this. Man. Night, NY Nick! Thanks for being here! I’ve got a Mojo Men 45 tucked away somewhere. Couldn’t find much info on them after I bought it. They had a staggering amount of recordings. Kind of two distinct periods of the band. First on Autumn, then Reprise, etc.. I love all of it. Fuzz guitar AND vibes! My all-time fave sound? I have 2 CD collections of the Mojo Men's music. Great liner notes included on both. Last show of the summer isn’t it? Thanks, Mailman. I forget who we had do those liners, it's been so long! Yeah - last show of summer. Makes me want to do a surf/hot rod show! But I'll prob save it for when it's freezing outside! Awww.... Knock me out - Ventures meet Zombies ! Sounds like a plan Bob !!! Will need some hot rockin' when it's fweezin' outside! It always gets a little loopy around this time at night. I'll take autumn any day. But then, my favorite Zombies song id "Beachwood Park". If the people can't get to the beach, we can bring the beach to the people! And by people, I mean us! Happy to play that for you, Simon! Thanks everyone for being with us! Means so much! See you again next week, same time, same place! Love to all! The July surf show was one for the ages!